Tinderbox User-to-User Forum (for formal tech support please email: info@eastgate.com) - How do I get started with this app? Tinderbox User-to-User Forum (for formal tech support please email: info@eastgate.com) › Tinderbox Users › Questions and Answers › How do I get started with this app? Re: How do I get started with this app? Tip: Cmd+click any links in the article to open the related link in a separate browser tab/window. So, what are attributes? Think of the Rolodex with pre-printed contact cards. In a TB context, each card is a note. Each discrete box on a card is an attribute. Some cards have no address, others no phone number, but every card has every box - attribute. So, out of the box, every note has lots of pre-defined attributes - referred to as system attributes (some 206 of them as at v5.9.0). Few if any users will need to use and adjust anything more than a few attributes, but that selection of attributes will vary from user to user. However, you're not limited to what's pre-provided in the way of attributes. You can add your own. Unlike many programs you're not limited in the number of extra attributes you can add. As with system attributes, once added every record has every attribute available. It's not even necessary to add attributes before you start work, you can add them any time which is great for adding extra structure when it's needed. Attributes can be of varying data types, but if that's a bit techie for you don't worry unduly, you can read up on that late. Certainly the built-in ones will be of a type suitable for the task at hand. To view/edit attributes there are three main methods. To see every attribute - system and user-defined - for a note, select it an open Info view (Cmd+Opt+i). To edit an attribute, select it in the right column, then double-click the box or use the Edit button at bottom of the view. In note text windows, you can select various attributes to be shown as 'key' attributes. These form a tabular display at the top of the note text window. The attribute values (unless read-only) can be edited in situ. This is probably the first way in which many users interact with attributes. There are lots of ways to set the items shown in the key attributes table but we'll come back to that later. Quickstamp (Cmd+1). This works on all selected note(s) in the current main view. Otherwise, quickstamp can be considered another way of using Info view. They can hold data: the title of a note or user-specified data associated with it. 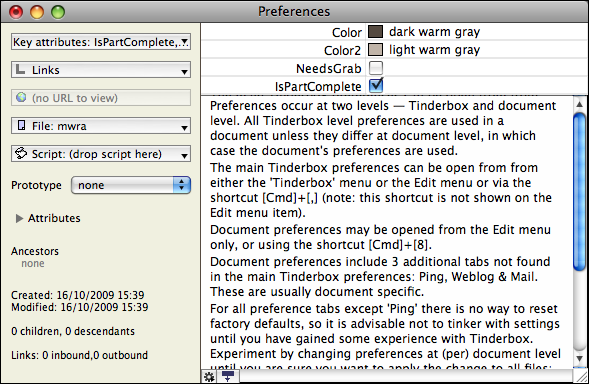 They can configure the Tinderbox UI. The number/selection of key attributes, the colour of notes, what sort of font is used for the title, etc. In Explorer view the selected note (and any key attributes) are shown in the right pane. These options can be toggled via the pop-up menu accessed from the cog symbol button bottom left of the text pane. See here for a description of sidebar features. But once I had them, I had no idea what to do with them. If you use the Map view, you suddenly get a whole range of ways of showing relationships or associations between the items of information (Notes) -- but you have to do a little more work to get these relationships to show up. I work in psychology and history, so I might want all the items that refer to Freud in some way (his name might appear in the title of the Note, or it might appear in the text of the Note) to be in blue, so that I can see which ones they are at a glance. And if I'm clever enough, not only can I get all the already existing Notes that refer to Freud to appear in blue, but I can have any Notes that I add later to change to blue _automatically_ if the word "Freud" appears in them somewhere. (*This is probably where the two Marks tell me I have got hold of the wrong end of the stick, but I hope not. *) I haven't yet worked out how I achieve this, but I'm guessing an Agent might do it. Where things get really interesting for me is the possibility of using multiple visual cues at the same time (shape, colour and position of the Note on the map, as well as lines linking Notes, and coloured backgrounds in certain areas of the map). Since I have to deal with multiple sources of data (articles, books, diaries, official documents, eye-witness accounts, etc.) and multiple themes (decision making, problem solving, attributions of causality, scripts and schemata, cultural influences on cognition, etc.) I can see that Tinderbox might prove very useful in allowing me to represent how these all relate to each other. So unless I've got things "a*** upwards" (self-censorship), to quote a former girl friend, displaying relationships and associations between items of information is where Tinderbox ought to shine. Please tell me now if I've got it all wrong, and I shall take myself off somewhere where I can't confuse the issue any further. Honestly, I don't know what to say. I'm blown away at what you've put together here. Thank you, and I hope this can be a resource for others. I'll DEFINITELY check it out in detail. that said, I wanted to give you a heads up that might not happen for a couple of weeks. Our son is graduating from high school this weekend and we've got family coming in and staying with us for the occasion, so combined with normal business and life stuff, exploring this app and playing with what you've laid out will have to wait until I come up for air. I didn't want you to think I haven't seen it or wasn't interested or grateful for it. and Martin, that is PRECISELY why I'm interested in this app. I don't need another notetaker. I've got Circus Ponies Notebook, which I really like for specific notetaking scenarios (like watching an educational DVD or lecture where I'm taking detailed notes). Also have OmniOutliner, which I no longer use since getting Notebook, and then I've got DTPO which I use every day. I don't need somewhere to create notes and store info. I'm interested in this app because I suspect it may help me understand the data I already have in new, interesting and ultimately edifying ways. And given that I tend to be a visually-based guy, the map view and its features has appeal to me. I'm looking forward to exploring it more. @Martin. No, you are on the right track. Maps do show links and you can add to the default range of link types via the Link Types palette. Another way to add new link types on the fly is when adding a link, in the Create Link simply add a link type name of your choice instead of selecting an existing one. The new type uses default styling but can be customised via the Link types palette. You are right about agents. Indeed, as your TB smarts grow you can use action code to create or remove links based on query matching. Powerful stuff. @conejo32. No worries. Like I say the posts up thread are by way of a sketch for a proper article. The challenge is threading the parts together in an order such as we don't lean on too many yet-to-be-explained features (somewhat hard in an app like this). Beginning analysis is a bit chick and egg. At outset it's impenetrable - as you find it now. As you familiarise yourself with features you'll begin to see how you can use incremental formalisation to slowly (or quickly!) increase you're analytical view of the data. It might be more attributes, extra links, or agents, etc... What you need out of the toolbox will vary. That's why playing around really does pay off, though I know - from experience - how counter-intuitive that may seem. C'mon, dive into the data pool, the water's warm! Thanks Mark -- there is nothing more dangerous than someone who thinks he knows what he is talking about, but doesn’t -- so I'm glad I got that bit right at least. I look forward to learning a bit more about the application. Conejo32 -- glad we're on the same track! 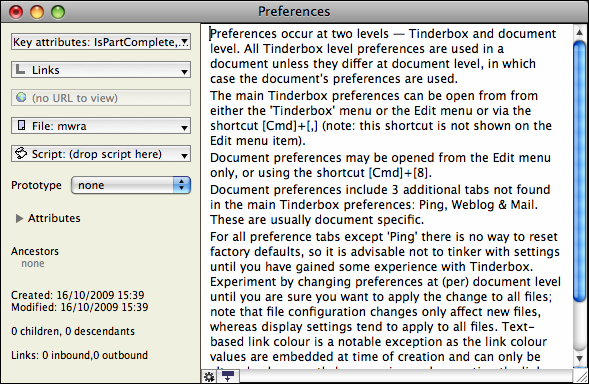 Having just come to the end of a big project, I'm hoping I can learn enough about Tinderbox to use it on the next one. I use DTPO, too, but there is something missing from it, and I think the visual representations of associations and relationships that you get in Tinderbox could fill that gap. I hope so.